Spudart’s post about the Chicago Cubs’ old jerseys made me curious about the history of their uniforms. I did a little google action on, “cubs uniforms throughout history” and came across this incredible ESPN article by Paul Lukas published just last week. If you’re fan of the Cubs, baseball, design or nostalgia, then you absolutely must read this article. 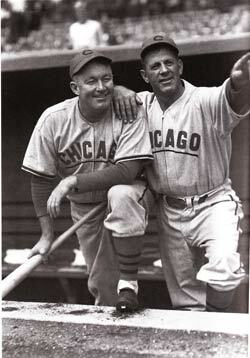 Lukas discusses how the Chicago Cubs are the definitive pioneers in baseball uniform design. He gives 10 (it’s actually 13) specific examples why this is so. Along with each example are multiple photographs. Each example has an explanation as to why it’s unique and just for fun he considers the “Curse Quotient” for each.